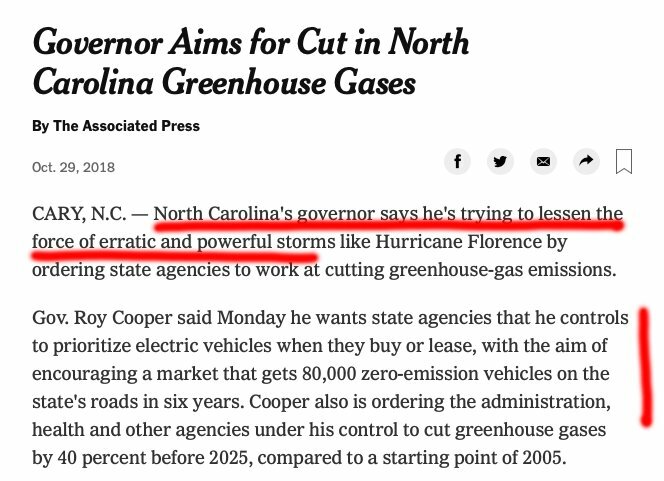 AP: "North Carolina's governor says he's trying to lessen the force of erratic and powerful storms like Hurricane Florence by ordering state agencies to work at cutting greenhouse-gas emissions." Morano: "Not everyone, however, is a fan of Warren's legislation... "This is virtue signaling of the highest order for her Democratic base, Marc Morano, the editor of ClimateDepot.com, said on "Fox & Friends" Wednesday. He argued that Warren's bill would give the U.S. government and the Securities and Exchange Commission extensive power to go after companies and "shake them down." Morano: "My book details the absurdity of all of this, pay up or face bad weather. The government has to protect us from bad weather." September 19, 2018: "The Politically Incorrect Guide to Climate Change" still ranked number 1 "best seller" in Climatology, Environmental Science, & Environment!